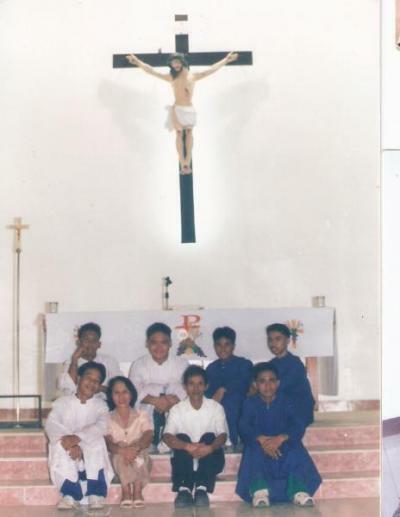 NOTRE DAME OF ESPERANZA INC. - K.O.A. Medieval Knighthood, in the service of manor lords,calls forth such ideals as honor,loyalty, justice,chivalry and respect for all.In the use of this term, the Altar Server is reminded of his duty to serve the Lord of lords with fidelity and honor, to treat others with respect and justice, and to live a good personal life, defending always the rights of God and His Holy Church. In the names page and squire, the server is reminded again of the years of patient practice and study that went into the training of a knight and should consider with what devotion and perseverance he should attend to his own training in the service of the Altar. The chevalier was a traveling knight, which should remind the server that he should be ever traveling toward his heavenly goal. To form a worthy guard of honor to our Divine Eucharistic King in whose service we willingly assume the dignity and honor of becoming Knights of the Altar. To render faithful, reverent and edifying service to God by assisting His visible representatives, the Bishops and Priests, in offering the Holy Sacrifice of the Mass and in all other liturgical and devotional functions; To enkindle in the hearts of the faithful whom we represent at the altar, greater piety and devotion by reverently performing the duties of our holy office and by giving good example in our daily lives. Holiness, or the fullness of Christian life, is given to us by God through grace, but requires a mature personality, a firm will and good habits. Our Christian life is not simply a life of do's and don't's, but rather a life of imitating Christ, our model, who is Perfect God and Perfect Man. Through grace and human effort we can acquire the virtues or good habits that make us better persons, by striving for that human perfection presented to us by Christ, not only when we reach heaven, but even here on earth. Virtues are not something abstract, separated from one's everyday existence. Like most other things in life, the virtues have to be learned. God may give them to us as gifts, but we should also cooperate with His grace and do our part. When we know more about the virtues, we begin to love them more, and we realize the good that they bring about. Little by little, we discover that it becomes easier for us to fulfil our duty of being good examples to others - good examples of ordinary persons in the middle of the world, just like everybody else, who live their Christian vocation fully, in the most natural way, so that others could see that the Christian life is a life full of joy, inspite of all the difficulties that man encounters in this world.